Eye on Justice is a magazine published 2-3 times a year with the purpose of working towards greater transparency in the justice system by monitoring the day-to-day work of justice sector workers. Through close cooperation with lawyers, judges and other members of the justice sector, MUSAWA receives information about breaches of laws and international standards within the justice sector itself and publishes them so as to highlight wrongdoings so that they will not be repeated and appropriate steps can be taken to undo them where possible. The reliance on an extensive network as well as trust in justice sector workers is vital for the accuracy of this publication and took years to establish. Through Eye on Justice, MUSAWA fulfills part of its role as a watchdog by increasing transparency in the justice system and holding actors accountable. MUSAWA is the only Civil Society Organization focusing on transparency in the justice system in this way. Justice and Law is one of MUSAWA's regular publications with a dual purpose. On the one hand, regional experts comment on judgments pronounced by Palestinian courts, which opens up dialogue in the law community and offers different views and interpretations of these decision which enriches the knowledge of law professionals in Palestine and increases transparency and accountability. On the other hand, the published articles discuss topics of international standards and best practice, which again enriches the debate on and knowledge of the law and justice community in Palestine. Due to the very specific nature of the publication, it is only available in Arabic. The Legal Monitor is MUSAWA's tool to record attitudes within and towards the justice system as well as track changes over the years. Furthermore, it is a tool to ensure transparency and civil oversight of the justice sector in Palestine over almost a decade now. In 2006, MUSAWA prepared and published the first Monitoring Report which is used as a baseline survey which all following reports have used as a base, and results are compared and contrasted between years. 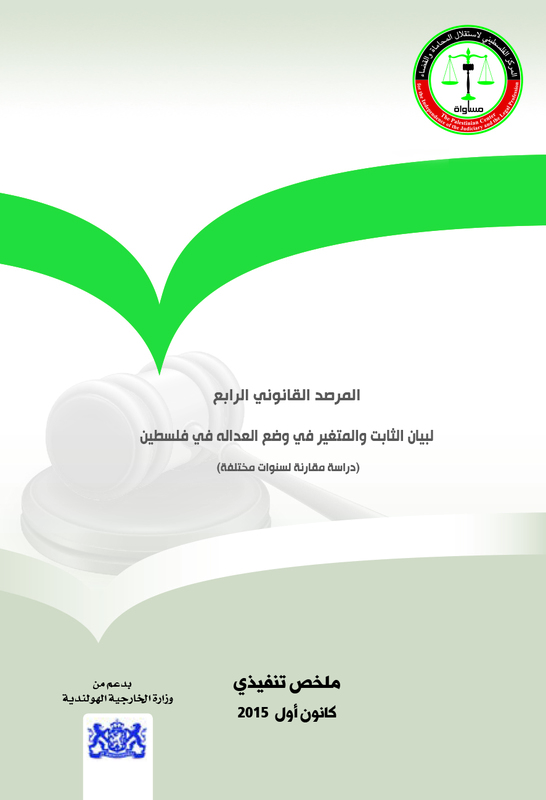 To ensure a valuable result, the report is published every two years and publicized to Palestinian decision-makers, legislative council, the civil society and the donor community and will be available in Arabic. A brief summary will be available in both languages. International good practice on designing and implementing justice sector assessments are always taken into consideration and updated when necessary. Each month, MUSAWA issues a newsletter that includes a summary of the most important activities MUSAWA carried-out throughout the month, in addition to its internal affairs and other external activities. You can find our newsletters both in Arabic and English on our website, or you can receive a monthly copy via email by subscribing at the bottom. ​January & February; March; April; May; June; July; August; September; October; November; December. ​January; February; March; April; May; June; July; August; September; October; November; December.